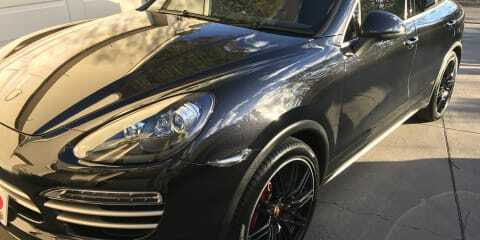 Porsche Cayenne, what a great car! It does the job, with excellent fuel economy and it’s extremely comfortable with the 18-way adjustable seats. The car is both admirable and gorgeous and turns a lot of heads, thanks to the combination of a black exterior with a white interior, and those black 21-inch wheels set off by the red brake calipers. I would recommend this car for if you want fuel efficiency. The car is not a performance horse like a GTS, it’s more like a cruiser for those long journeys or something around town if you want great fuel efficiency, (a full tank lasts us for two weeks) and that includes some hard driving. I bought the car, as I wanted something that was practical, fuel efficient and desirable. I travel long distances so I needed a diesel to do the job efficiently. Some say it is not a real Porsche because it’s a diesel. Cry me a river! The diesel is a great engine. It has a tonne of torque (more than some supercars) and has plenty of power around the city. The car does sound like a quiet tractor and it doesn’t make any noise, but that’s a great thing for me as I like things to be quiet. I don’t need the monstrous sound from a GTS. People are quite surprised when they figure out its a Porsche diesel. 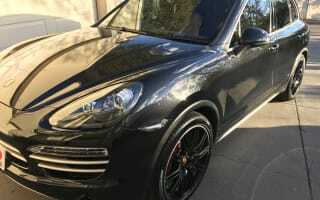 I upgraded from a 2012 BMW X3 30d, which had a lot of great performance, though it was extremely uncomfortable, so that’s why I went for a Porsche. Furthermore, in my area, a tonne of mums drive X5s so I wasn’t going to upgrade to one. No one drives a Cayenne in my area so I thought it’d be nice to have something more unique. They only deliver 1500 Cayennes a year compared to over 100,000 X5s, so the Porsche is rarer and desirable. I dislike the visibility. Yes, the mirrors look great, but they are not practical for that reason. The Bluetooth is slow to connect to a phone. The rear-view camera graphics are poor. My old 2007 Tarago had a better quality rear-view camera! And the options list was awfully long. I would’ve expected half of the options to be standard. The car sometimes has turbo lag but only on the odd occasion. The cabin of the car is amazing! I love the buttons and I love the design. After seven years of this design, it still remains modern. I can’t fault the interior or exterior. The car is extremely reliable and I hope to keep it for another year. I’ve purchased the Two-Year Extended Porsche Warranty, just to be safe, though, even though the car has caused no troubles for me for the past three years. It’s been much more reliable than my 2012 BMW X3, which went back to BMW a few times. The practicality is perfect. The large size SUV does the job. I am definitely buying another Cayenne in a year’s time. When the new shape arrives in Australia, I hope to order a GTS this time. Future improvements could be the transmission (I don’t like the way the car shifts gears, I use the paddle-shifters), better mirrors, a nicer rear-view camera, a faster diesel six-cylinder engine, and a better list of standard equipment.